To Resubmit or Not To Resubmit? Home > To Resubmit or Not To Resubmit? Lesley McCollum is a graduate student in Neuroscience at the University of Alabama at Birmingham. After surviving the grueling process of submitting an NIH F31 NRSA application, her grant was awarded on resubmission. You can follow her on Twitter @lesleyamccollum . Around this time a few years ago, I was patiently waiting for any news. Ok, by “patiently waiting,” I really mean “obsessively checking the status of my application online.” For the most recent wave of F31 NRSA submissions —as I’m sure the applicants are well aware—review committees are beginning to meet to discuss and score those applications. If this was your first submission, brace yourself—you likely won’t be receiving an award notice in your inbox (those aren’t doled out until later anyway). A few fortunate applicants will be awarded on the first round, but the majority won’t make the cut. So next comes the big decision to revise and resubmit your application, or let it go. After getting a “Not Discussed” (see below) on my first submission, I received funding for my application on my resubmission. I’ve shared a few things below that I learned during my process of revising and resubmitting my F31 application. For both my new submission and resubmission, my review committee met the first week of March and my score was posted just three days later. To streamline the review process, review committees only discuss the top 50% of applications. That means half of the applications submitted will receive a “Not Discussed” rather than a score. Not Discussed doesn’t mean your application has no chance for resubmission, but it does mean that it has a long way to go if you decide to revise and resubmit. The other 50% of applications receive an Impact Score based on several review criteria, and a percentile based on that score. Some NIH Institutes post paylines from previous years to give applicants an idea of what percentiles were funded. Not all are hard boundaries though—some institutes report vague paylines that allows them to fund applications that may not have received as high of a score, but more directly align with the mission of the institute. And of course, the funding climate is not what it once was. Scores that may have been fundable in the past may not be anymore. So even if paylines are posted from previous years, the percentage of funded applications depends on the current amount of money available to distribute. It’s tempting at this point to immediately contact your Program Officer and ask if your score is high enough to get funded. Don’t do it. They can provide little information with just the score, and will likely recommend waiting until you’ve received your summary statement. Your summary statement will come next. The length of time before it’s posted varies—for my new submission it took four weeks, but just two weeks for my resubmission. You won’t receive an email notifying you it’s ready, so click on the application in eRA Commons and keep an eye on the “Other Relevant Documents” box. It will be posted there. Even though my application received “Not Discussed” on the first submission, I still received a summary statement. Each of the three reviewers provided a summary critique, though only two provided additional comments on each criteria. Read through your summary statement. I tend to blaze through it for my first read, assuming they must not have read all my application—of course I addressed all those issues already! The next day, or after the emotions have settled from the first read-through, read it again. This time read it carefully, taking note of their concerns, referring back to your application, and assessing the level of the critique . Some critiques  can be easily addressed with a revision, though others are at a more fundamental level and may not be revisable in the same application. For example, not including enough experimental detail in your research strategy can easily be fixed with a revision. A concern about lack of training potential (common for F31 applications) or the impact of the study will be more difficult to overcome. Some F31 applications with great scores aren’t funded if the sponsor is a new investigator. NIH funding agencies like to see that the sponsors have a solid track record of mentoring previous predoctoral students (even better if they’ve mentored previous F31 recipients) and of funding in the research area of your proposal. Consider whether the concern could be addressed by having a more senior faculty member co-sponsor the application and provide a letter of support—it shows that you’ll receive the training support you need, as well as demonstrating a collaborative environment at your institution. This is the time to contact your Program Officer. Start by sending an email to let him/her know that you’ve reviewed your summary statement and would like to discuss the potential to resubmit your application. Then ask for a phone meeting. Your Program Officer can help interpret the summary statement. They will likely be able to provide insight that you are not able to get from reading it yourself—and since they often attend the review meetings, they will have additional information you may not, like if the reviewers were excited about your proposal. Even if you are able to address all the critiques, it can be hard to move forward with an application without some interest and excitement from the reviewers. Your Program Officer should also be able to tell you if your application landed with the best Study Section for review. A review committee unfamiliar with your field of research may not be able to appropriately discuss or assess the science in your application, and it may have more of a fighting chance with a different Study Section. Now it’s time to decide: resubmit or not? Consider all of the things above—your score, summary statement, seriousness of critiques, and input of your Program Officer. If you are able to, discuss options with your thesis committee. Also consider your timeline—the next cycle deadline is likely out of the question, so your resubmission won’t go in until the following cycle. It starts over in the process, and even if it gets funded, your earliest project start date (when you can start using those funds) isn’t until several months after the submission deadline. As soon as you review your summary statement, start revising your application. The Advisory Council—which determines the applications that ultimately get funded—still doesn’t meet for a few months. So you won’t know for sure yet if the proposal has been awarded, but chances are that you’ll have to resubmit. My Program Officer was honest and upfront about the likelihood of my proposal getting funded, but offered me the opportunity to share my rebuttals to the critiques I received. Since I intended to resubmit, and had already started revising my application, we devised a revision strategy, targeting aspects that stood out as the largest weaknesses to the reviewers. Respect the reviewers and thank them for their input to strengthen your proposal. If they made a critique that you disagree with, respectfully respond with a logical argument and references to support your reasoning. Make it clear what changes you have made, and make it easy to locate them in the text. Reviewers will read your responses and check for your revisions. Add in new information. It’s ok to make changes outside of what the reviewers suggested. If it doesn’t address a specific concern, though, don’t count on it to make up for other critiques. Note in your response what updates you made (and where), and how they strengthen the application. Embrace the criticism  that reviewers provide and use it to build a better application for your resubmission. You only have one chance to resubmit, so if you have to rush to get it in by the next deadline, you may be better off waiting. 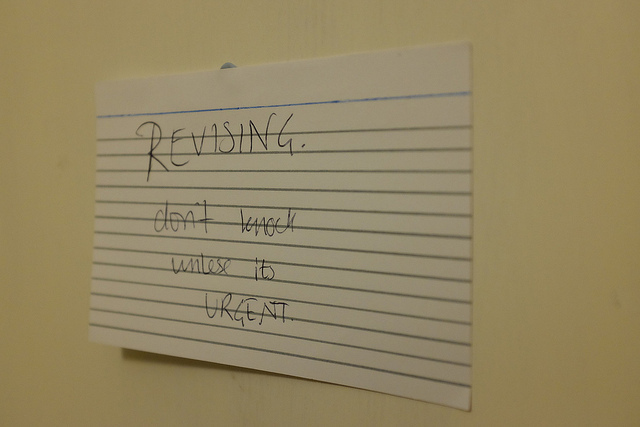 Take care to revise the application to make it perfect. Choosing to not resubmit doesn’t have to mean the end of the road. If reviewers have concerns about the feasibility or impact of your study, maybe the specific aims need an overhaul and could be composed as a new application. (Make sure to get familiar with the differences between a new submission and resubmission .) Consider other options as well, such as revising your proposal and submitting it to a private grant foundation. If your proposal doesn’t go any further, don’t consider it a loss or a waste of time. Figure out what you can learn from it  and look for the silver lining . Submitting a grant application is a huge feat and you have already gained valuable experience  in the grant writing process, which is vital to a career in academia. Have you had a successful resubmission experience or found new life for a rejected proposal? Please share it with us in the comments!